OSAKA, Japan/DETROIT/WASHINGTON (Bloomberg) -- The emerging crisis over airbags traces back to a little-known Japanese company that for over 20 years has supplied the safety devices to automakers including Toyota Motor Corp., Honda Motor Co. and General Motors Co.
Airbags made by Takata Corp. are linked to at least four deaths and more than 30 injuries in the U.S. after the safety devices deployed with too much force, spraying metal shrapnel at occupants. U.S. authorities have begun an investigation and almost 8 million cars made by 10 automakers have been recalled to fix the hazard. Though the probes are ongoing, one focus is likely to be Takata’s choice of an unusual explosive chemical to inflate its airbags in milliseconds, according to auto industry executives. The Japanese parts maker four years older than Toyota also has said it dealt with lapses in quality control at its plant in Mexico. Takata spokesman Toyohiro Hishikawa today declined to comment from Tokyo today and referred questions to Alby Berman, a representative in the U.S. Berman didn’t respond to two emailed requests sent outside normal business hours to discuss the company’s choice of chemical for its airbags. Takata shares have plunged 51 percent this year. The unfolding crisis marks a fall from grace for a company that rode Japan’s postwar industrialization to became a global powerhouse in seat belts that saved lives. Having now been responsible for making some vehicles more dangerous, Takata’s failures add to growing doubts about auto safety and how well motorists are protected by regulators. Takata’s recent woes are rooted in airbag inflators, a component it started making in 1991 in Moses Lake, Wash. While parachutes deploy by the relatively simple act of pulling a ripcord, the inflators that set off airbags are more complex. Chemical compounds are used to form propellant, which is compressed into aspirin-like tablets. In less time than it takes to blink, an igniter heats up the tablet inside a high-strength steel tube after a crash. The ensuing chemical reaction fills the airbag with gas, inflating it at more than 200 mph. In the late 1990s, Takata made ammonium nitrate the chemical-of-choice for its airbag inflator design, said Siebert, who was advising for the airbag market in Europe at the time. The compound went into cars including BMW 2000 BMW 3 Series, 2001 Honda Accord and Civic and 2001 Nissan Maxima and Pathfinder. Honda cars use airbags with ammonium nitrate, spokesman Teruhiko Tatebe said by phone. 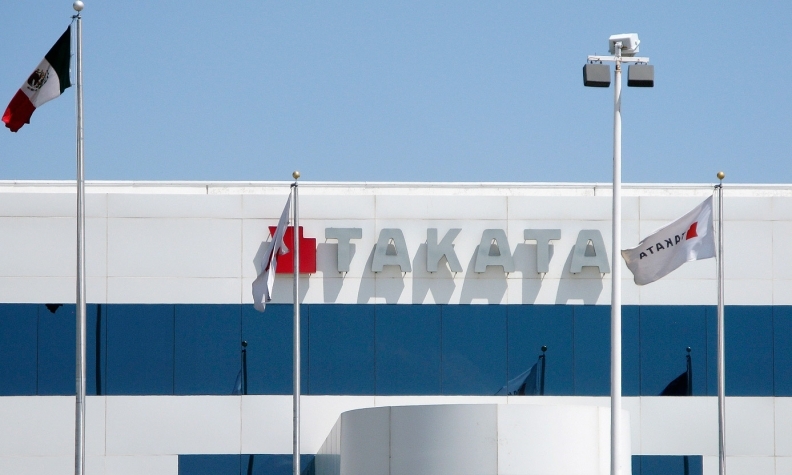 The automaker is Takata’s biggest customer. The weakness of Takata’s choice of chemical propellant lied in its sensitivity to moisture, said Scott Upham, president of Valient Market Research. Takata may have used an organic compound called 5AT, with AT standing for aminotetrazole nitrate, said Upham, who has followed airbags since they were first going into cars a quarter century ago. When ignited, too much force can be created by propellant that had been rendered unstable by the moisture, he said. The company improperly stored chemicals and mishandled explosive propellants used in its airbags at its plant in Monclova, Mexico, Hitoshi Sano, the company’s vice president of investor relations, said during an interview in August. In 2005, Takata closed a Georgia plant that made inflators and shifted production to the Mexico factory, about 300 miles southwest of San Antonio. In March the following year, a series of explosions rocked the factory and led authorities to evacuate houses nearby, according to an Associated Press report at the time. The factory resumed full operations within a month, and Takata’s customers managed to avoid production disruptions, a feat that Automotive News called “remarkable” in August 2006. Takata was used to getting praise around this time. Then-President Juichiro “Jim” Takada was halfway through a decade-long period in which his company made airbags for now-recalled cars when the top U.S. auto safety regulator presented him with an award in 2005 for improving auto safety. While Takata may not be a household name outside of Japan, it shares roots with Toyota, the world’s largest automaker. Both started in the 1930s as part of the country’s textile weaving industry and were among the companies that produced equipment for the Imperial Army during World War II. After the war, founder Takezo Takada visited the U.S. and returned home impressed by the research he saw on early-generation seat belts. Japan’s car industry was still in its infancy then, with fewer than 40,000 autos produced in 1952. Takata developed their own seat belts using methods inspired by parachutes, which it made for the military years earlier. Its first two-point belt sold in 1960. Within three years, they were in mass production and started becoming a standard option in cars. In 1973, Takata was the lone company whose seat belts passed a National Highway Traffic Safety Administration crash test standard at 32 mph, according to the company’s website. Takata began research into air bags in 1976. Juichiro Takada, the son of Takezo who had taken over the business, was reluctant to enter a fledgling airbag market he viewed as risky, according to Saburo Kobayashi, a former Honda engineer who spearheaded the automaker’s use of the safety devices. Takada had reasons for reservations. Airbags deploy through contained, controlled explosions. Their designs are drawn from rocket propellant and munitions industries. At a New Year’s party thrown by Honda in 1985, Takada said he wanted his company to stay out of airbags, Kobayashi wrote in his memoirs published in 2012. Already in the midst of battling internal resistance to air bags within Honda, Kobayashi kept pressing. Takata had a unique position as the only supplier at the time who’d mastered the four cornerstones of the necessary production techniques: weaving, coating, sewing and folding, he wrote. In secret, Kobayashi reached out to Takata’s lead engineer on airbag development, who moved forward with covert production of samples. The go-ahead within Honda came in 1986, when Kobayashi convinced then-President Tadashi Kume that air bags, with their “one in a million” defect rates, would enhance the automaker’s reliability, Kobayashi wrote. Takata moved past its initial reservations and plowed ahead. By the late 1980s, it had set up a production base for airbags and other components in North Carolina. Kobayashi, now a guest professor at Japan’s Chuo University, declined to be interviewed, writing in an email that he’s not in a position to comment on the current crisis after being out of the industry for more than 10 years. Honda spokeswoman Akemi Ando said she would check on Kobayashi’s account of the company’s history and said the automaker doesn’t approve new technology unless it’s safe. Kobayashi’s description of Takada’s remarks are “out of context,” said Takata’s spokesman Berman, without elaborating. If the comments were made, they must have been at the “very beginning of airbag development,” he said. Airbags today save “tens of thousands of lives a year” and Takada’s dream of zero fatalities caused by car accidents still drives the company and its employees each day, Berman said in an email. He reiterated the company’s interest in supporting NHTSA’s investigation and the vehicle recalls. Going forward, the task of protecting the legacy of his family’s 81-year-old dynasty falls to Shigehisa Takada, grandson of Takezo and son of Juichiro, who died in Tokyo in February 2011 at the age of 74. Shigehisa, 48, ceded the role of president last April after six years on the job, a month after Toyota, Honda and Nissan called back a combined 3 million vehicles because of defective Takata airbags. The position went to Swiss-born Stefan Stocker, the first non-family member to steer the company. Stocker, 60, had joined Takata just three months earlier from Robert Bosch GmbH’s Japan unit. Takata has declined multiple requests to make executives including its chairman and president available to discuss its airbag woes. Automakers including Honda and Toyota are standing by Takata, for now, though Upham predicts the company may lose out on airbag inflator contracts to suppliers including Autoliv Inc. and Daicel Corp.